I’ve mentioned a few times that I’m trying to use up a 3 pound can of sliced almonds. Even after this recipe, I’m only halfway through the can! Luckily I have a long list of almond recipes to try, it’s just a matter of finding the time to make them. To be honest, I wasn’t expecting much with this one. The recipe caught my eye because it had a short ingredient list, didn’t require any grocery shopping, and made a fairly small yield (I wasn’t in the mood to bake 6 dozen cookies). It’s simply ground almonds mixed into a chocolate meringue. The original recipe calls for making very small cookies, then sandwiching them together with chocolate. I decided to make my cookies a little bigger, using a tablespoon of dough rather than a teaspoon, and adding another few minutes to the bake time. I was definitely surprised when I tasted these – they were really, really good. The outsides were crispy, and the insides were moist and fudgy. Even though there’s not much fat in recipe, the cookies tasted very rich and decadent from the cocoa powder. In fact, I thought making cookie sandwiches would be overkill, so instead I just drizzled some melted chocolate over the top. I will definitely be making these again, probably sooner rather than later. Isn't it the best when you're pleasantly surprised by a recipe? :) Good luck getting through those almonds. It's a good problem to have! surprisingly good recipes are always a winner! These are talking to me! They look scrumptious! I can really tell how delicious these macarons are. The recipe sounds very forgiving too. What pretty macaroons! I bet they taste as good as they look! Oh Sarah.. these look fabu! I am dying for chocolate and should have gone to bed hours ago! NOTE to self.. stay out of kitchen and look a the pretty pictures on Sara's Blog instead!!! Oooooooh....Sara! These look excellent!! Yummie! These look beautiful. A great combination. I can't wait to see how you use the rest of the alonds. simple perfection! They must be great...chocolate and almond...chewy and delicious :) Yummy! Macaroons are one of my all time favorite coookies, if they are made right! It looks like you were spot on!!! They look & sound fantastic! Another well done to you, Sara. These do look so yummy! I like that extra drizzle of chocolate over them too! These look amazing...I love coconut in cookies! If I had almonds in my house I would be making these today. oooooooooo I like the way you made them much better!! Totally tasty! They look so yumm. And i am sure they tasted delicous too. Good call on making them larger and drizzling them with chocolate. I think they look fantastic! Almonds are such a great ingredient, they just add so much personality to any baked treat. This recipe sounds partilarly delicious! What a mouth watering photo! When you grow tired of almonds, send them to me:) Here, the price of almonds is climbing..
very pretty! they sound like they taste amazing! I'll take a dozen.. or two.. of those! I love the chocolate decorative markings on the top. Very classy looking. How lovely, the almonds probably add such a good flavor. thanks for the recipe! I am always on the lookout for something easy, lowfat, and yummy! Wow...triple threat!!! Good luck with your other almond recipes. They look delicious. I've got to give them a try. These look amazing, Sara! Wish I could reach through the screen! Those look like fantastic macaroons. Great use of your almonds. 3lbs of almonds? Holy smokes! Can't wait to see what you use them to make next! These look awesome! I love chocolate and almonds together. They look so delicious with the drizzle of chocolate on top. I like the changes you made. Chocolate and almond is so yummy together! mmmmm. love macaroons. especially with chocolate!! Nice and light and crunchy - they sound great! Yum! My brother used to love macaroons around passover but I haven't had any in years. Almonds are a good staple. I've had some in my pantry for a few weeks that I just used and I was surprised how many recipes it was easy to pop them into! I have always loved macaroons, and these look so good! They're very pretty. Pretty enough to eat! I better not even look at that recipe. I would probably end up eating too much. These macaroons and a bowl of ice cream would be heaven! These macaroons look scrumptious! Chocolate and almonds are so delicious together! Delicious. 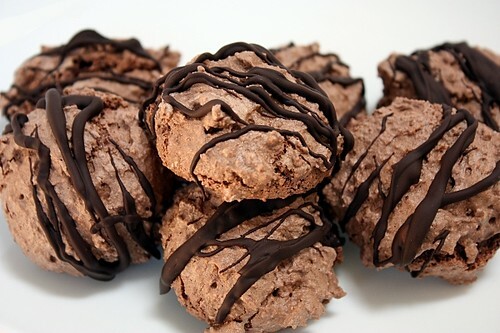 I used to make coconut-choclate meringue cookies like that and it's true that they do taste surprisingly moist and fudgy and rich. Keep giving us those almond recipes! These are really just the perfect cookie! They look fabulous! I love this kind fo recipe, and chocolate and almonds together is delish! Macaroons are just heavenly to begin with, in my opinion, but these look even better. Chocolate and coconut together wow what a winner. these look and sound great!!! How can you go wrong with chocolate, almond and coconut? Very tempting...great picture. I love almonds. I love chocolate. I Love these cookies. Beautiful and Delicious! The photo sang to me. Really. Even the cat woke up. Delicious. When I have extra almosnds - my husband finds them and eats them. Not roasted. Plain. He just eats them. It means never having extra almonds. Or hiding them. My father could not get enough of these coolies, although I would have fought him over chocolate ones! these are so pretty! i love almond macaroons! I've made something very similar to this before- i love how the texxture is smooth, crispy, and creamy all in one! This is a recipe you can be sure I'll try! It even deserves a Stumble!